I find Beringer interesting. Not so much for their wine, itself, but rather the huge variety they have within the wine they produce. They make several bottles under $10 and several costing $200+ a bottle, with many, many bottles in between. There are not very many wineries than can claim such a feat. 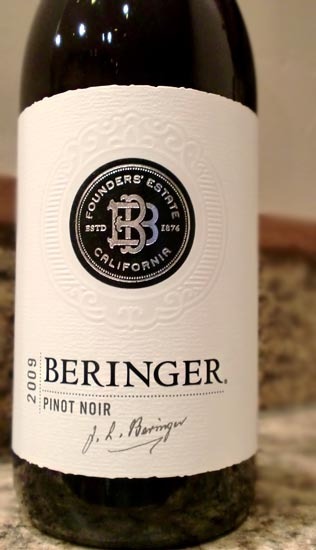 Today's review is the 2009 Beringer Founders' Estate Pinot Noir made in good ol' California. Considering how many wines Beringer produces, it's surprising this is only the third wine I've reviewed from them (having already reviewed their California Collection Cabernet Sauvignon and Chardonnay). The 2009 Beringer Founders' Estate Pinot Noir pours a medium-bright ruby color and has light aromas of strawberries and cherries. Tasting reveals pretty much what you would expect from the nose: sweet cherries, cranberry jelly, and a hint of pepper in the short finish. This wine doesn't have those gamey mushroom and barnyard notes that can make Pinot Noir amazingly dynamic and interesting. It's one of the more candied and sweet Pinot Noirs I've had in quite some time. But if that's your thing, then I guess here's a bottle for you! I could see this pairing remarkably well with Thanksgiving turkey with a bit of cranberry sauce. It would easily be overpowered by any heavier, meatier dishes. But hey, Thanksgiving is coming up this month! All in all, not my favorite $10 Pinot Noir, though there's nothing that will be off-putting or polarizing to anyone. Drink This: if you want a simple, sweet Pinot Noir. Don't Drink This: if you're looking for those Old World funky Pinot Noir characteristics.